I don’t pretend to be a political commentator. I’m not saying we should let others shoot, bomb, chemically kill, or destroy each other without intervention… but to kill in response to killing just seems to me to be so simple-minded and unwise. So… painfully predictable and human. How can we best respond to hate? How do we best respond to war? I’m not a political scientist, nor a trained soldier… just another one of God’s children who believes there must be a better way. Death and destruction are the ways of this world… this we have known since the beginning of recorded time! We have reacted to violence with violence! Often feeling there was no other way! What if there is a way to respond that aligns with the call from Heaven? God’s response to war? He calls us to Love and Peace! What would love do? What would radical love look like? How can we diffuse hatred across the Ocean, across the World so far away? How can we fuel love when anger, hurt and fear seem to be in control? Love is the answer, however unlikely to be embraced. I realize how naive I must seem to think perhaps it is possible for love to permeate the chaos! With God though all things are possible! 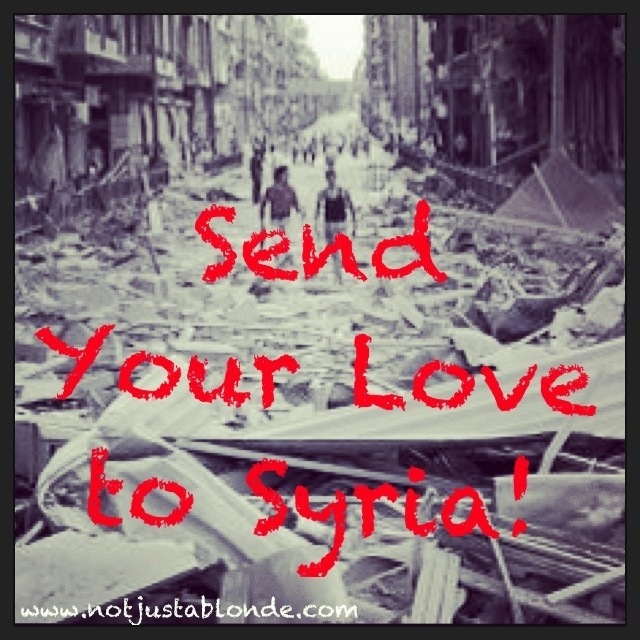 So now I will pray for all caught in Syria’s fire and will send them my deepest love and a prayer for Peace. Will you join me in this prayer and let us call on Heaven to heal the hurt with LOVE! ← My NALT video: Not Just A Blonde blogger… talking not typing!